There is something about hand knit socks that creates a divide in the world of knitting. While it’s not impossible to have mixed feelings about socks, it certainly seems rare. People either love or hate socks. There is either always a pair on the needles or never. I can’t understand how something so small could be so polarizing! So if you haven’t weighed in on socks it might be time to make your first pair and find out where you stand. If you like to take a class for new things (I know I do) Jackie is teaching a sock bootcamp, learn to work double pointed needles, turn a heel, pick up stitches, and shape a toe, all in just 3 hours! Next ones are March 9th and April 13th so sign up soon. If you are looking to try your first pair of socks solo the Lumberjack socks are done in a DK weight for a quicker knit. Simple ribbing and cuff down construction make these a simple first pair. For the advanced sock knitter, why not something a little wild? 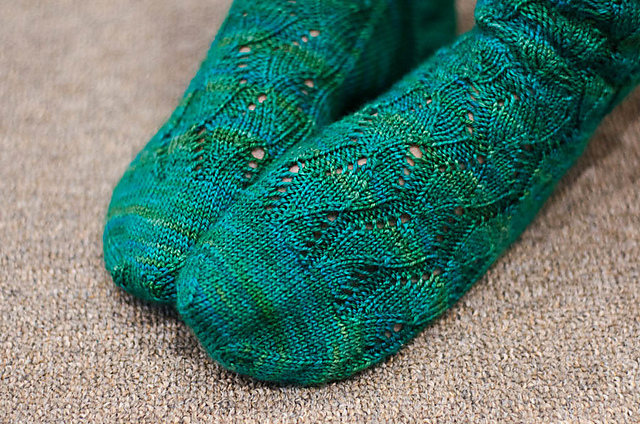 Felicia, otherwise known as SweetGeorgia, has a lovely new sock pattern, Rushing Tides. These pretty socks would be wonderful in pretty hand dye, it’s hard to picture them in anything but a sea green or ocean blue. This entry was posted on Tuesday, March 5th, 2013 at 9:13 pm	and is filed under Uncategorized. You can follow any responses to this entry through the RSS 2.0 feed. Both comments and pings are currently closed.